Live lunchtime Q&A session | What Car? Welcome to What Car? 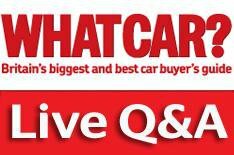 's weekly lunchtime Q&A session live on whatcar.com. Settle down with your lunch, tap in your questions and our experts will be on hand to answer any car-buying questions you have. Our team should be able to cover all subjects, whether it's a new car, used car or a problem with your current car. However, some questions might be too involved to sort out in a single lunchtime. We'll let you know what to do if so. The live Q&A session has now ended. Come back on Tuesday, June 22 at 1pm for our next live Q&A. Replay our previous live Q&A sessions by clicking below.